Tattoo Science Moisturizing Tattoo Lotion is a special nourishing moisturizer for the life of your tattoo. Apply daily to keep your tattoos looking new and your skin looking fresh. Contains Creatine and Aloe for soothing Moisturizing. Also contains vitamines E, C, B3, B5, and B6. All great for your skin health and elasticity. Available in our fragrance free formula or with a light clove oil for a really unique and wonderful clove scent. You pay a lot of money and endure a lot of pain to get your body art looking perfect. Well care for those tattoos and keep the lines sharp and the colors bright. Tattoo Science can help make that happen. 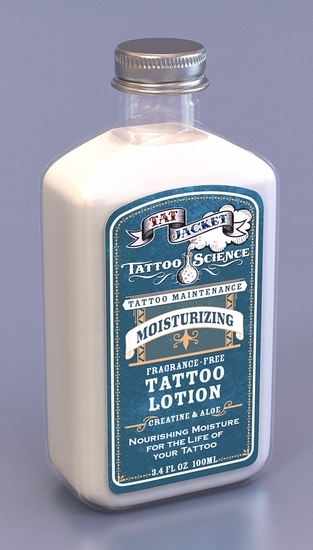 This FRAGRANCE FREE MOISTURIZING LOTION was designed with tattoos in mind. That's why we say "Where ancient art meets modern science".